Kindle for iOS App was updated by Amazon yesterday to give the ebook readers control over the spacing in the text. The latest version gives users a host of new line spacing options that let you customise how tightly the text is displayed, i.e. you get to choose between loose, normal and tight line spacing. The updated version also allows you to add multi-page highlights. Now users can highlight lengthy passages spanning multiple pages. Another notable feature of the update is that you can now filter the ebooks and other stuff by type like notes, bookmarks and highlights. You can also sync starred notes between devices. To improve accessibility, Amazon has added the ability to let users select a higher maximum font size. The app has also received some bug fixes and stability improvements. 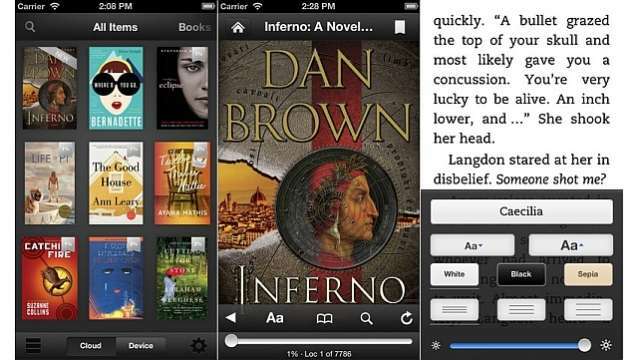 The native Amazon Kindle App for iOS devices has been optimised for the iPad, iPhone and iPod touch. The app lets you read Kindle books, newspapers, magazines, textbooks and PDFs, and gives you access to over 1,000,000 books on the Kindle Store, in addition to several newspapers and magazines. With this update, reading ebooks can be fun on the Kindle App. Get the updated Kindle App from Apple Store here.